Omicron Delta Epsilon. Delta Theta Phi. 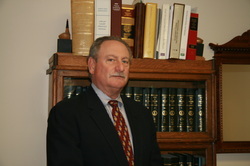 Member 1979 – 1988 and Chairman 1980 – 1988, Town of Herndon Architectural Review Board. Commissioner, Chancery of the Circuit Court, Fairfax County, Virginia, 1988 — present. Board of Directors, Chantilly National Golf and Country Club, 1998 – 2004. Virginia and represents clients throughout northern Virginia.